They’re the three best friends that anybody could have, and they’re in Bangkok. And you guys may or may not be ready for the WTF moments! The Hangover II starts off with the typical phone call from Phil saying “We fucked up”, so yes, you kind of know how everything went down according to the first Hangover movie. I was really excited to see what crazy stuff the wolfpack would do in Thailand, and yeah, it was a night they were better of not remembering. The movie starts off with yet another wedding, this time is Stu (Ed Helms) the one who’s getting married, this time for real unlike with certain prostitute in Las Vegas, Stu is marrying Lauren (Jamie Chung) in an island in Thailand since her parents live in the country and apparently is a big deal for them to have the wedding there and to finally meet Stu. Phil (Bradley Cooper) and Doug (Justin Bartha) are invited over to IHOP by Stu, since the poor guy is so traumatized about what went down in Vegas that he decided to have a “Bachelor Brunch”. Phil and Doug protest and ask him to have a REAL bachelor party. They also tell him that if it wasn’t for the best hangover of his life he would have never broken up with his ex-fiancee, with whom he was very unhappy, and if it wasn’t for that he would’ve never met Lauren. He realizes what they say its true but then Doug also suggests that they should bring Alan (Zach Galafianakis) with them since he is very heartbroken that he had not been invited to the wedding in Thailand. The boys pay up a visit to Alan, and tell him the good news. As they’re in the airport they are introduced to Teddy (Mason Lee) who is Lauren’s little brother, who becomes a pivotal character to the story since after having some beers at the beach in Thailand… you know how things turn out and Teddy is the one missing this time. I loved the fact that this time the movie was in Thailand, this way you know if things were crazy in Vegas they will be 3x as crazy on the other side of the world where there are trannys everywhere, monkeys that smoke cigarettes, kids that get tattoos, missing limbs, etc. Oh, and the infamous Leslie Chow (Ken Jeong) is back in this one, and more screen time than before so get ready all of you toodaloo motherf***ers! 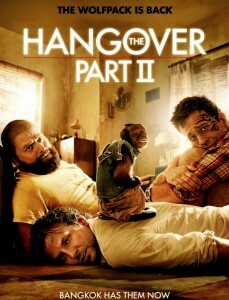 The movie was funny, yes, but I couldn’t stand the fact that it followed the same story structure as the first Hangover. You get the phone call, then you go back in time and see what happened, they wake up, find clues, there’s a trade-in, someone’s locked in somewhere, etc. I could keep going and you would see I’m telling you the same things that happened in the first movie. I wish they would’ve taken the movie in another way that isn’t repeating The Hangover’s effective comedic formula. Still, The Hangover II has its hilarious moments and it is enjoyable. Anyone out there going to watch a movie this weekend make sure you check out The Hangover II because you’re guaranteed a good time. Some of you, like me, will see the similarities and kind of know what will happen eventually according to the previous one. And yes, stay during the credits because well, the pictures are revealed! Will there be a The Hangover 3? Who knows. I think it has to happen because this cast is just great and everyone loves them, and duh, $$$$. I just hope that they take the story in a completely unexpected way, and have the audience wondering what will happen next as they did in the first one. The Hangover II is now in theaters. Previous ArticleConcert Review: ADELE is phenomenal live! Next ArticleListen to Episode 6 of our TYF Podcast!